...... converted tracks with their real names (Title, Artist, Album and etc.) and sort ripped music into folders. 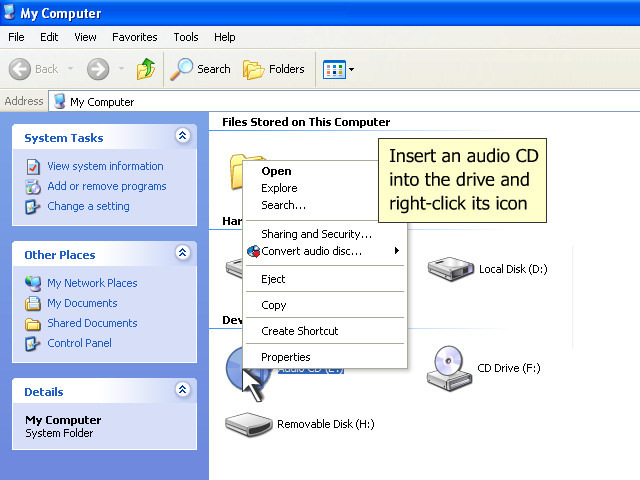 Once installed it completely integrates into Windows and becomes a part of it adding "convert a CD" option to the context menu. So you won't launch any program to rip your favorite audio CD to hard drive. Qweas is providing links to One-click CD to MP3 Converter 1.13 as a courtesy, and makes no representations regarding One-click CD to MP3 Converter or any other applications or any information related thereto. Any questions, complaints or claims regarding this application One-click CD to MP3 Converter 1.13 must be directed to the appropriate software vendor. You may click the publisher link of One-click CD to MP3 Converter on the top of this page to get more details about the vendor.